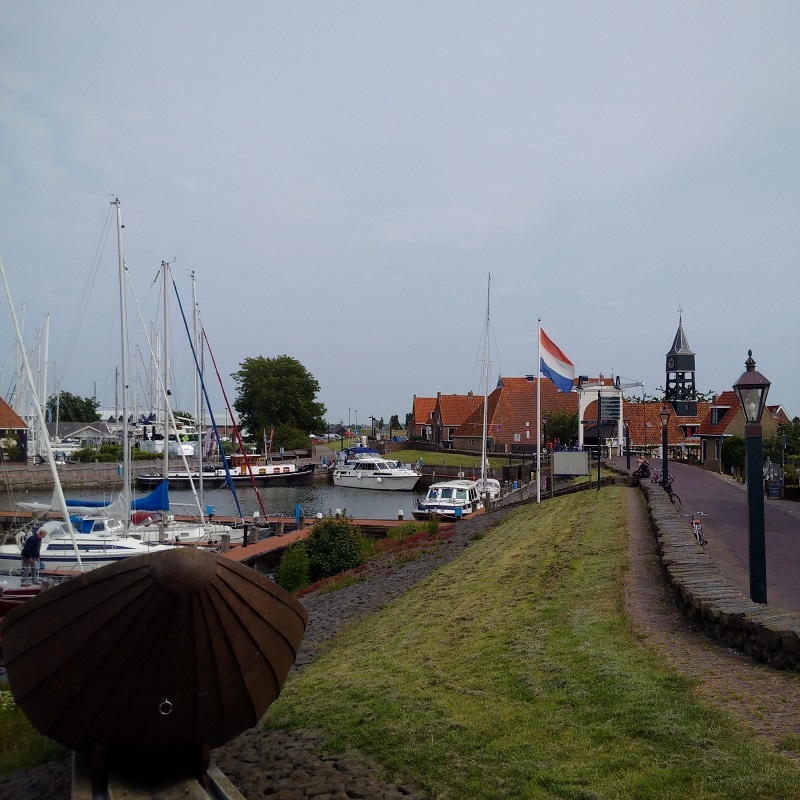 A smooth cruise diagonally across the Ijsselmeer from Medemblik to the quaint sailing port and attractive village of Hindeloopen. 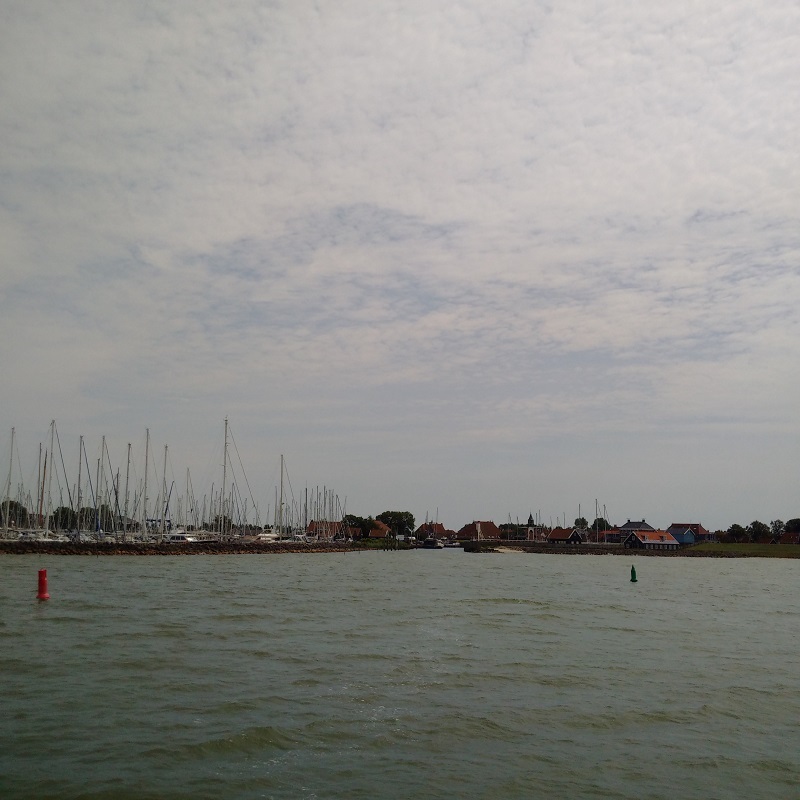 I had reckoned that Medemblik was only a venue for a single day and so it was always planned that we leave after one night and the other factor was the wind; which had calmed down to a Force 3 today. I walked Max to the bakers for some bread and also settled our mooring fee; which amounted to €18 for the night. Kathleen had been running the washing machine twice to wash clothes and so I got out the hose and filled up Lady Martina’s water tanks from the nearby tap. This water was free but had a ‘pop-out’ timing mechanism and so I had to get a wrench to clamp it in position to make the task much easier! As I did this, I engaged a local man in conversation; he making the usual comment about us having come across the North Sea (it being so 'dangerous!') and he had his elderly mother with him who was wondering about the origins of our boat’s name. 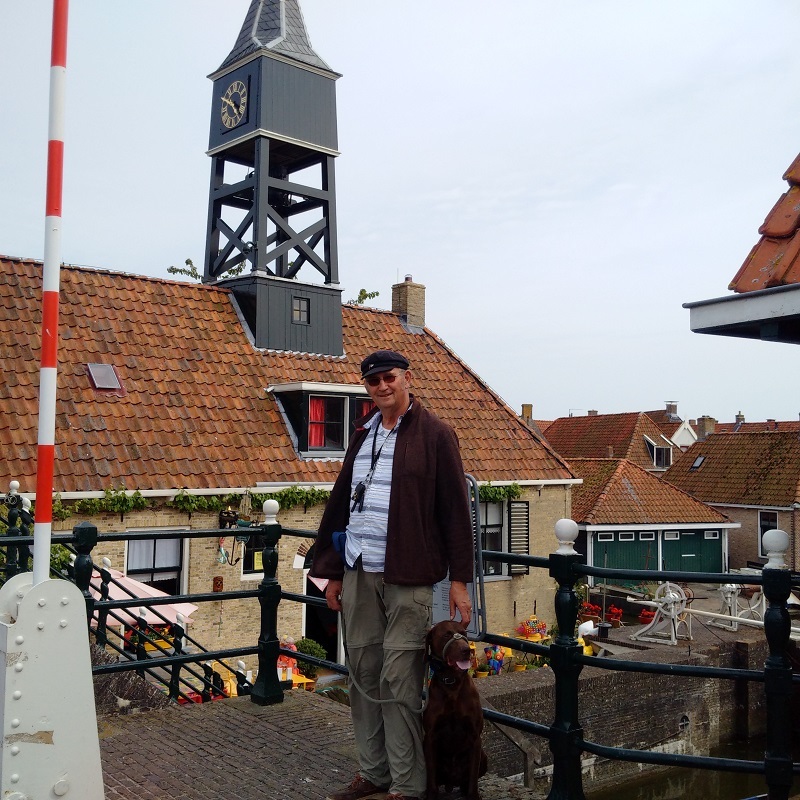 This all done, and the boat prepared, we started the engines and made our way along the Westerhaven, over to the Kwikkelsbrug bridge which opened for us. We then had a very pleasant cruise for two and a three-quarter hours in a north-easterly direction for 16nm at a speed of 6 knots, directly against the wind but the breeze rarely rose above 10 knots (and that was more than the 6 knots forecast) and so the sea was smooth to slight and the passage very comfortable. We arrived in Hindeloopen and then entered the Hylper Haven (rather than the marina) to find the same old harbourmaster, who tells me that he has been here over 20 years, dressed with his white-badged skipper’s hat and grand mustache. We were directed to the south-east wall, which suited us as we could moor bows-to the afternoon sun and then I walked back to the harbourmaster to introduce myself. Later on, he introduced me to three guys on board a neighbouring old tugboat who reckoned that they had met me 12 years ago when I was with another boat and skipper called ‘Michael’. A good walk with Max along the flood-wall and foreshore and were able to let him off the lead for a run with two other dogs. There had been a ‘dogs on lead’ sign but the sheep were in other sections which made it possible. Once back, I started writing my ship’s log and journal and then we decided to have an evening meal out; it being the 4th anniversary of our first meeting at the Northampton Ceroc dance event! I took advice from those guys who said that ‘De Hinde' had the name but 'de3harinkjes’ (the Three Little Herrings) around the corner was the restaurant of choice these days and so we changed and I took Kathleen there later. We had house specials; delicious garlic soup to start with and then baked eel to follow, before the inevitable apple-cake and cream to share.